The Catholic Women Organization, Nigeria (CWON) held its 34th General Executive Council meeting and the launching of the 22nd edition of the Women Echo Magazine in Abeokuta, Lagos Ecclesiastical Province on October 27th – 29th2017. Activities commenced on October 26 with a courtesy call on the Metropolitan Archbishop of Lagos, His Grace, Most Reverend Adewale Martins represented by Msgr. Anthony Obanla, the Chancellor of Lagos Archdiocese. EXCO and BoT members together with officials of Lagos Province and Archdiocesan CWO officials also called on His Eminence Anthony Cardinal Okojie, Emeritus Bishop of Lagos, before proceeding to Abeokuta to meet with the Bishop of the Diocese, His Lordship, Most Rev. Dr. Peter Kayode Adetoyinbo. On the invitation of the Alake of Egbaland, members of EXCO and BoT celebrated mass at the private Chapel of the Paramount Ruler of Egba Land, Oba Alake of Egba Land, Michael Adediran Gbadebo Okukenu IV. The Alake also received them at his palace after the mass where he gave the group words of advice and his blessings. He also showed the group the first bible and stressed that Abeokuta was the place where Christianity took root in Nigeria. On October 27, Exco and BoT members were received at Ogun State Government House by the Secretary to the State Government who extended the Governor’s warm regards and largesse to the association. The Governor was given a plague for being gender sensitive. Activities on Saturday, October 28, 2017 started with a holy Mass celebrated by the Bishop of Abeokuta Diocese, His Grace, Most Rev. Dr. Peter Kayode Adetoyinbo together with Rev. Prof. Peter Tanko, National Chaplain CWON and Rev. Fr. Anthony Famoroti, CWO Abeokuta Diocesan Chaplain. 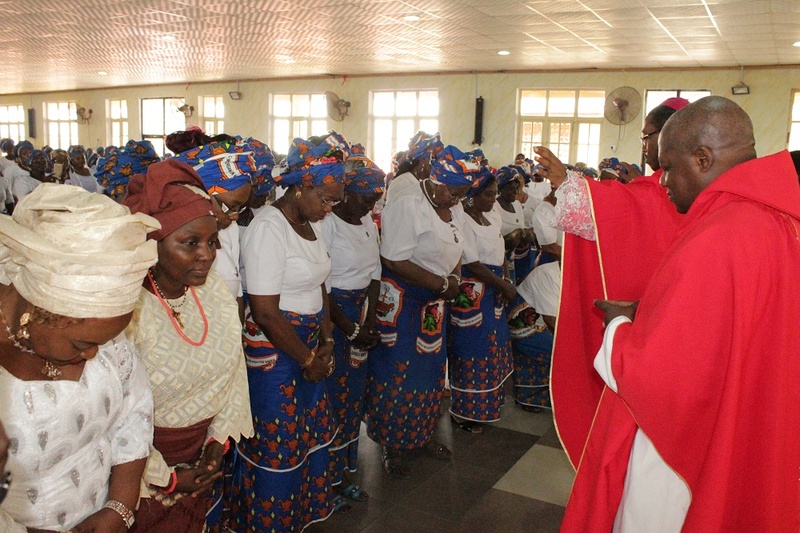 The mass was immediately followed by the Women Echo magazine official presentation to the women and and invited guests. In her welcome address, the National President CWON Mrs. Cecilia Nwanneka Okolo appreciated the guests and promised to give her best in order to move the CWON to the level of appreciable empowerment and spirituality for the catholic women with special attention given to the family. Also speaking, the Catholic Bishop of Abeouta Diocese, Most Rev. Peter Adetoyinbo commended the CWON under the leadership Mrs. Okolo for rolling out a well packaged magazine and reminded the women that God holds them dearly and for that reason they must hold themselves up as such and be role models in their families and the society at large. The Special Guest for the occasion and wife of the Executive Governor of Ogun state, Her Excellency Dr. (Mrs.) Olufunso Amosun who was represented by one of her aides pledged her commitment to the cause of women and promised to do even more. Dr. (Mrs.) Amosun was later presented with an award by the CWON in recognition of her role in the up-liftment of women in Ogun state in particular and Nigeria in general. In his goodwill message, the chairman of the occasion Prince Ogundipe traced the history of the CWON and urged the members to continue to emulate the virtues of the Blessed Virgin Mary in order to succeed in whatever they do as a group and in their individual families. Also speaking, the President of the Laity Council of the Catholic Diocese of Abeokuta charged the CWON to remain focused in order to perform their role in the church reminding them of the Laity Council’s motto of: One Laity One Church and One Church One Laity. The nine (9) provinces of CWON also launched the Women Echo magazine. With magazine launch over, the National President immediately called the 34th National Executive Council meeting to order. Matters of interest were deliberated upon, top of the list being CWON’s commitment to evangelizing the society. A twelve-month evangelization programme for all dioceses and parishes was distributed to members. The meeting ended at 9.30pm followed by dinner. The 34th National Executive Council meeting finally ended with a 6am Holy Mass on Sunday, 29th October 2017.